Paul Sharkey has brought another important recent book on Spain to my attention. This one focuses on the blood price of the much-lauded and so-called ‘peaceful’ 8-year transition from Francoism to a ‘well-tied-up’ and Franco-endorsed monarchic democracy, a period in which upwards of 600 people were murdered for ‘reasons of state’. 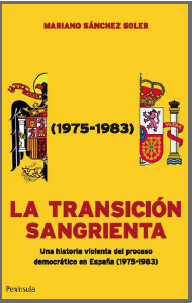 ‘La transición sangrienta’ (‘Bloody Transition. A violent history of the democratic process in Spain 1975-1983’) — by 58-year old journalist and lecturer Mariano Sánchez Soler — exposes the vicious policies implemented by the unchanging repressive organs of the rump of the Francoist state, desperate to avoid justice and to retain its power and privileges. The author traces the links between the Establishment’s ‘dirty war’ against ETA, GRAPO and other anti-State groups during the eight-year period that saw the regime revert to state-sponsored covert terrorism (GAL — Grupos Antiterroristas de Liberación — Anti-terrorist Liberation Groups) backed up by special criminal legislation, and a systematic policy of brutal repression bearing the hallmarks of the immediate post-civil war period — all deployed to control the streets and political opposition to the disgraceful ‘Pact of Silence’ that gave immunity to some of the bloodiest criminals in European history since 1945. The victims of Francoist violence have suffered a double-death; they have been murdered, and their murders — and murderers — ignored!